Nearly 30 years ago I sat in one of David Allen’s seminars on personal productivity and heard him say, “Virtually every problem that would show up in your business can be traced back to communications; somebody didn’t talk to somebody about something.” The truth of that statement was brought home to me recently as I met with a long-time client. Our monthly discussions tend to be an equal mix of business strategy and people management issues. The CEO realized that on those rare occasions when people’s performance fell short or when a project did not turn out as planned, the cause was almost always a breakdown in Communication. Indeed, somebody didn’t communicate something to somebody. When things go wrong, instead of looking for “who screwed up,” look in the mirror and ask yourself what you could have done differently or better. Whether you are running a large organization or a front-line team, the results they achieve are an outgrowth of the communication you have with them. 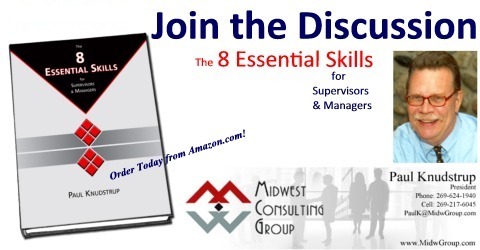 You may want to check out Skill 2 – Communicating for Results in “The 8 Essential Skills for Supervisors & Managers” To ordervisit Amazon.com.